VeryPDF PCL Converter can not only help you convert PCL to PS, but also convert PRN to PS. 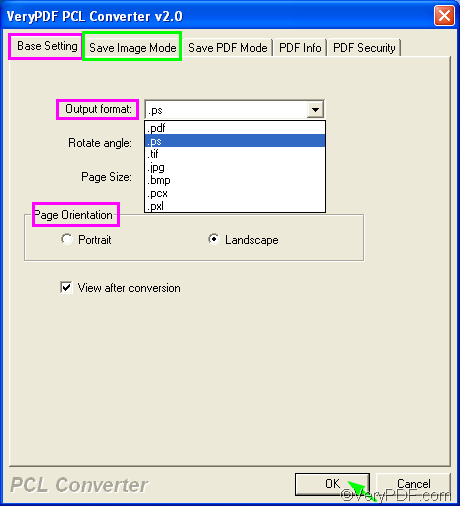 In addition, you can set page orientation, color depth, resolution, etc., when you convert documents. This article explains how to use the GUI version to convert PRN to PS and set page orientation. If you don’t have VeryPDF PCL Converter, please download it by clicking here. After installing the tool on your computer, please do as follows create PS from PRN. If you can find the icon of VeryPDF PCL Converter on your desktop, please double click the icon with your mouse to run the application. If you can’t find the icon on the desktop, you can do as follows: open the Start menu by clicking Start, > point to All Programs, > point to VeryPDF PCL Converter V 2.0, > click VeryPDF PCL Converter V 2.0. The simplest way to input PRN files is to drag the files you want to convert from Windows Explorer, and then drop these files into the list box of the main interface. As soon as you see the added PRN files listed on the interface, you can proceed to the next step. To remove some listed PRN files, you can select them and then press Delete on the desktop. Click the second button named Setting under the list box. Then the dialog box for setting will be displayed on the screen. Look at the illustration below, the default tab control is Base Setting, where you can set page orientation as well as output format. If you want to set color depth and resolution, you should switch from the Base Setting tab control to the Save Image Mode tab control by clicking the second tab. And then set orientation and color depth there. After setting all the options, don’t forget to click OK.
Click Start under the list box, select a folder in the pop-up dialog box, and then click OK. The computer will quickly convert PRN to PS for you. In a few seconds, you can go to check the result files. How to convert PCL to PCX and set color depth? This entry was posted in VeryPDF Blog and tagged prn to ps, set page orientation. Bookmark the permalink.